If it were so simple to increase your leads, then everyone would be doing it and business would be stellar. This dilemma is why a solid inbound marketing program is not just one step or one improvement, it is a thorough overhaul. Without going through all the proper steps, your campaign will not be as successful as possible. If you need a refresher, read my prior blogs to find out where your planning should start. Once you have the ground work, we need to start increasing your leads, or converting for short. So what does converting mean? In short, converting is getting someone who has visited your site to give you their information and enter themselves into your lead pool. People may do this for many reasons but if you are putting out content that readers find useful, they will want to give you their information to stay informed. If your content is not hitting the mark with readers, then you will struggle to get leads. 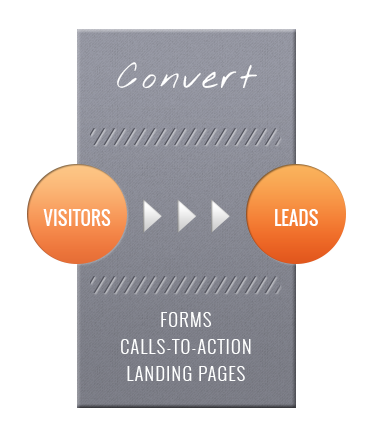 The conversion process from a visitor to a lead is a subtle and often abused art. There is a fine line between asking for someone’s information, blasting them with spam or popups, and being too subtle and missing out. If you have been to a website and find it difficult to get contact information or reach out to a company, they have missed the mark. Similarly if you have been to a site and immediately been blasted with pop ups, spam flyers and the like that have turned you away, then the art of subtle messaging has lost them your business. The balance lies in the middle, it’s an art of creating content that people are willing to offer their information in exchange for. The means to accomplish this are relatively simple in theory but take time and practice. Your biggest friend is your content as we discussed prior, but how you package that content males the difference. If you came view a blog, there always is (or should be) a subscribe here link for readers. Many blogs will have a Call To Action (CTA) like the one below. These are your conversion tools. Without a space for your web visitors to enter their information, there is zero chance of them becoming a lead. The first step in increasing leads is to give them the opportunity to become a lead! Once you have setup a space for your web visitors to become leads you can apply that form to most of your content as you see fit. Again, the balance here is to not ask for too much in return for too little but I will touch on this more later. Once you have the basics covered, then you can begin to branch out with content aimed at target visitors. If most of your vacation guests come from a certain location, cater some content aimed at that geographic. The opportunities to create content are limitless but lest focus on the 3 methods the Paveya infographic emphasizes and discuss them. 1) Forms- forms are the simplest way to ask for information. Generally, a form is any set of questions you ask someone for them to get content. “Enter your email address to subscribe”, “Fill out the form below with your information for a free growth session”, and “By entering your information you will receive our e-book” are some general ways to entice people to fill out your form. 2) Calls To Action (CTA)- A cta is usually a button or image that suggests you do something. You can find a CTA above in this blog, that blog leads to a landing page, with a form. When creating CTA’s, testing is crucial as the most minor things like color, font and size seem to play a role in click rates. So, creating a CTA is constant state of change to maximize your conversion. 3) Landing Pages (LP)- A landing page is the page that a CTA leads you to. These pages should be highly targeted based on the CTA your visitor clicked through. For example, clicking a “learn more about topic Y” CTA will bring you to a LP based on information and education with offers for e-books and knowledge. A CTA titled “Buy now” will bring you to an LP focused on the sales pitch and gets you in direct contact with a sales team. Using these 3 mediums in a properly setup marketing plan will create an increase in the quantity, but more importantly, the quantity of leads that come to your vacation rental company. The next step is the one most business owners want to skip to but by laying the ground work you will be better prepared! As always, if you have any questions, comment and ask away!